This evocative account of the improbable American adventure in Lake Placid explores the untold stories of the U.S. upstarts, their Soviet opponents, and the forces that brought them together. Award-winning sportswriter Coffey casts a fresh eye on this seminal sports event, giving readers an ice-level view of the boys who captivated a country. "The Boys of Winter is an evocative account of the improbable American adventure in Lake Placid, New York. Drawing on hundreds of hours of interviews, Wayne Coffey explores the untold stories of the U.S. upstarts, their Soviet opponents, and the forces that brought them together. 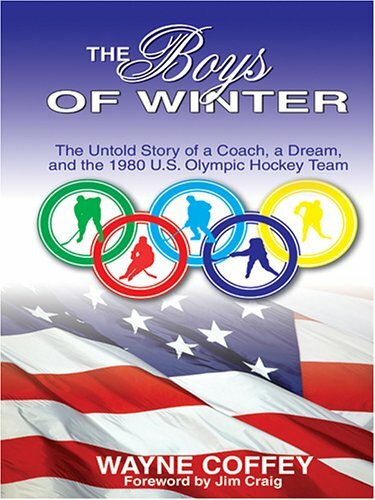 Coffey casts a fresh eye on this seminal sports event in "The Boys of Winter, crafting an intimate look at the team and giving readers an ice-level view of the boys who captivated a country. He details the unusual chemistry of theAmericans--formulated by a fiercely determined Brooks--and he seamlessly weaves portraits of the players with the fluid, fast-paced action of the 1980 game itself. Coffey also traces the paths of the players and coaches since that time, examining how the events in Lake Placid affected and directed their lives and investigating what happens after one conquers the world. Told with warmth and an uncanny eye for detail, "The Boys of Winter is an intimate, perceptive portrayal of one Friday night in Lake Placid and the enduring power of the extraordinary. Wayne Coffey is a sportswriter for New York's Daily News.